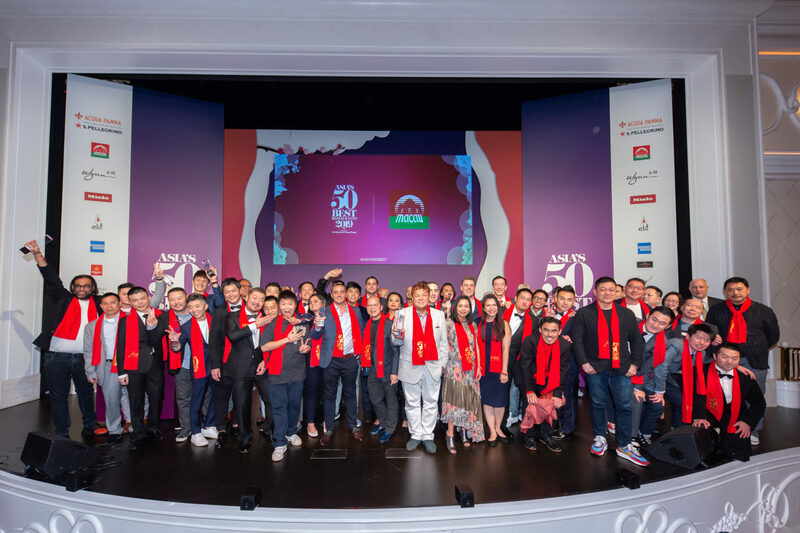 Tonight, top restaurateurs, chefs, food media and industry insiders converged once again at the Wynn Palace in Macau to celebrate what’s been dubbed the local “Oscars of the food world”: Asia’s 50 Best Restaurants 2019. Modelled after the World’s 50 Best Restaurants, the awards are determined by a purportedly anonymous (although many industry insiders will tell you otherwise) judging panel of 300+ industry experts (restaurant critics, chefs, restaurateurs and food influencers) divided by region, who cast 10 votes each for the best restaurants they have dined in personally over the last 18 months. This year, Odette edged out Gaggan (#1 for the past four years) to take home the top honour, after cracking the list in 2017 and jumping to #2 last year (it currently sits at #28 on World’s 50 Best Restaurants). The restaurant is helmed by chef Julien Royer and serves French food with Asian influences from within the National Gallery Singapore. Gaggan Anand, a titan among chefs, seemed to graciously applaud the change, having even stated last year that he wished not to appear at all on this year’s list, in order to effectively pass the torch to his peers. The rest of the top 10 was more or less a reshuffling of the usual suspects, with the exception of Taipei restaurant Mume (#7), which garnered loud applause as it rose from #18 to crack the top 10. In total, 10 new restaurants entered this year’s list, including a country debut from Malaysia, which joined the club with Dewakan (#46). Japan leads the list with 12 entries, while Hong Kong snagged a total of nine spots this year, including a new entry for VEA (#34), the profusely popular Michelin-starred Chinese-French restaurant from chef Vicky Cheng, and Seventh Son, a Cantonese institution in Wan Chai, which landed at #44. The biggest climbers were chef Daniel Calvert’s Belon, which jumped 25 spots to #15, picking up the Highest Climber Award and cementing another victory on the back of its Michelin win; and celebrated Cantonese restaurant The Chairman (#11), which jumped 11 spots in the rankings. 8 1/2 Otto e Mezzo Bombana climbed just one spot to #12, but its ebullient chef Umberto Bombana led the team to win this year’s Art of Hospitality Award for outstanding service. Meanwhile, Ronin and Caprice mysteriously and unexpectedly dropped off the list altogether. Other notable winners across the region included Toyo Eatery at #43 (last year’s Miele One to Watch), which helped the Philippines secure a spot on this year’s list after being left out in 2018; while Macau got one more new entry (Wing Lei Palace, #36) to join Jade Dragon, which sits at #27 — both exemplars of exquisite Cantonese fine dining. As always, the festivities leading up to the grand reveal tonight were peppered with a series of accolades awarded to supplement the finite list. The inaugural American Express Icon Award went to the talented Seiji Yamamoto of Nihonryori RyuGin, while the Miele One To Watch Award (usually a good indication of entry into next year’s list) went to JL Studio in Taichung, helmed by chef-owner Jimmy Lim, whose modern Singaporean dishes have marked him as a rising star in the region. One of the biggest winners of the night was Garima Arora of Gaa; previously sous chef at Gaggan, she opened her small tasting counter in May 2017. She picked up Highest New Entry (#16) as well as elit® Vodka Asia’s Best Female Chef — an award that has been criticised on the World’s 50 Best stage for the implied inequity in a gender-specific award. In Asia, pushback has been more measured, with the award generally welcomed as a chance to shine a spotlight on female chefs. Arora joins an elite group of prior winners including the Hong Kong chefs May Chow and Vicky Lau. The anointed 50 “best” restaurants, at least for the next 12 months, will fly to the top of bucket lists for jet-setting gourmands, make headlines across food media, and spawn numerous “best of” listicles that feed off each other on the endlessly regurgitating internet space. But the question brought up every year remains: Is it a real and true survey of the best restaurants in the region? As always, the new list should be both celebrated and taken with a healthy dose of scepticism. Each year seems to spur a fresh round of debate over the validity and fairness of the methods used to deem the final tally, and with Asia’s 50 Best now in its seventh year running, restaurants are becoming increasingly more savvy (whether in subtle or not-so-subtle ways) at “playing the game”, as one prolific restaurant PR put it recently. The truth is, the identity of many of the judges are known by other chefs/restaurateurs, and inviting them in for complimentary meals is par for the course these days. But when landing on the list can double or quadruple your business, can we blame those for playing it to their advantage? At the end of the day, it’s hard to overestimate the importance these awards have come to play in influencing a restaurant’s bottom line. Whether you’re a naysayer or a supporter — there’s no question that recognition in some form or another deserves to be given to those who devote their lives to the back-breaking task of restaurant work. For these 50 restaurants that have been designated as the best in 2019, a chance to shine on stage is a hard-earned validation and a vote of confidence to keep on forging ahead, against ever-increasing odds. For more information on this year’s list, visit theworlds50best.com/asia.